Over the past 15 years almost the entire developed world has at some point hit recessionary periods with short-term interest rates at 0, and it will likely happen again. Since the 1990s, the zero lower bound (ZLB) problem—when short-term interest rates are at zero and thus cannot be cut further—has moved from being a textbook curiosity to a clear and present danger. In recent years, several advanced economies have entered prolonged spells at the ZLB, and research has shown that episodes of hitting the ZLB are not as rare and short-lived as once predicted (Hess et al. 2011; Rachel and Smith 2015). The economic factors underlying the increased likelihood of hitting the ZLB are well-understood and unlikely to reverse in the future, making it imperative that policymakers factor this higher probability into their thinking going forward. These factors include rising inequality, aging populations, and global savings gluts. We need to enter the next recession with space for lowering real short-term rates; a higher inflation target will give us that space. Given the increased probability of hitting the ZLB in the future, policymakers should make sure we hit it with an economy at higher rates of inflation than current Federal Reserve targets. Riding out future ZLB episodes with higher inflation rates will give cuts in short-term interest rates more traction to shorten recessions and aid recoveries. The current too-low inflation target did not provide this needed traction during the Great Recession. Besides the factors leading to the increased probability of hitting the ZLB in future recessions (rising inequality, aging populations, and global savings gluts), one of the most striking developments in the American economy in recent decades is the large increase in household debt. High levels of debt make “low-inflation traps”—a vicious cycle of too-low inflation and the ZLB combining to make monetary policy ineffective in stemming recessions—particularly damaging. This is because falling inflation transfers purchasing power from borrowers to lenders, and this transfer will reliably put another heavy drag on economic growth. The policy response to the Great Recession was radically weaker than what textbook macroeconomic analysis would have called for. In short, we needed a big and sustained increase in federal spending to boost aggregate demand. Instead, policymakers in Congress cut short fiscal stimulus far too early and followed it with historically slow growth in federal spending. The Fed acted more wisely, but monetary policy just has much less ability to restore aggregate demand, particularly in the face of fiscal austerity. We should not assume that future policymakers will be able to act more wisely or effectively. This makes the value of avoiding future crises much larger, even at the potential expense of higher inflation. In this vein, policymakers should view a higher inflation target as a monetary economic stabilizer akin to automatic fiscal stabilizers, instruments that kick in when needed to provide a buffer against negative demand shocks without requiring a proactive discretionary policy response. The zero lower bound on short-term interest rates (or ZLB) has been recognized as a potential problem for policymakers for decades.1 The intuition is simple enough: central bank reductions in short-term interest rates have become the primary policy tool used to fight recessions and spur recoveries in recent decades. Recessions and sluggish growth occur when spending by households, businesses, and governments (i.e., aggregate demand) is too low to spur the hiring of all available workers and maintain full employment. Cutting short-term rates boosts aggregate demand by putting downward pressure on long-term rates, which spurs households to consume more and businesses to invest more. This theoretical problem has become a pressing real-world problem in recent decades. Japan has been stuck at the ZLB for most of the past two decades. In the euro area the short-term policy rate has been below 1 percent since the end of 2013. And in the United States, the short-term policy rate controlled by the Fed hit zero late in 2008 and stayed there for 7 solid years before increasing in December 2015. Research undertaken since the onset of the Great Recession suggests that this proliferation of ZLB episodes over the past decade is no statistical fluke. For example, Hess et al. (2011) have highlighted that earlier estimates of the probability of hitting the ZLB (which were roughly 5 percent) were far too low. By using improved estimating techniques and analyses of longer historical periods, Hess et al. (2011) show that the actual probability of hitting a ZLB episode over a 5-year horizon is instead 25 percent (Hess et al. 2011). This same research shows that the probability of extended ZLB events also roughly quintuples. 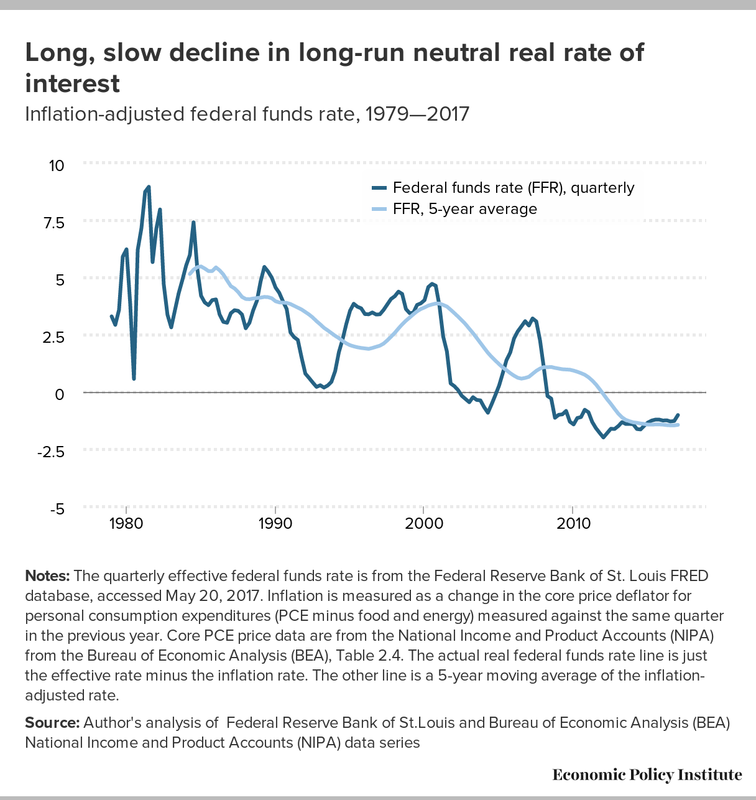 Finally, Rachel and Smith (2015) document a key reason for the increased likelihood of hitting the ZLB: a measurable decline in the long-run neutral real rate of interest. This neutral rate is the inflation-adjusted short-term policy rate set by the Fed that would prevail when the economy is at full employment and inflation is stable. When forces in the American or global economy put consistent downward pressure on aggregate demand, this neutral rate is pushed down as lower rates become necessary to secure full employment. This chronic downward pressure on aggregate demand is sometimes referred to (somewhat confusingly) as “secular stagnation.” What it means from a policy perspective is simply that macroeconomic policymakers (fiscal and monetary) will need to make policy more expansionary than in the past simply to keep the economy at full employment. Essentially, this means a combination of lower interest rates or higher fiscal deficits or more progressive taxation or higher spending. In the American economy, the decline of the neutral rate seems relatively clear in the data, as shown in Figure A. Notes: The quarterly effective federal funds rate is from the Federal Reserve Bank of St. Louis FRED database, accessed May 20, 2017. Inflation is measured as a change in the core price deflator for personal consumption expenditures (PCE minus food and energy) measured against the same quarter in the previous year. Core PCE price data are from the National Income and Product Accounts (NIPA) from the Bureau of Economic Analysis (BEA), Table 2.4. The actual real federal funds rate line is just the effective rate minus the inflation rate. The other line is a 5-year moving average of the inflation-adjusted rate. This chart shows the federal funds rate (the short-term policy rate controlled by the Fed) minus the current rate of core price inflation (core inflation excludes the influence of volatile food and energy prices). This average real short-term rate seems clearly to be declining, and the trend is even clearer in the line showing a 5-year moving average of this rate. The spectacular rise in American income inequality is well-documented by now. Figure B shows the growth in income shares by income percentiles in recent decades. The sharp increase in top 1 percent (and above) shares are evident. 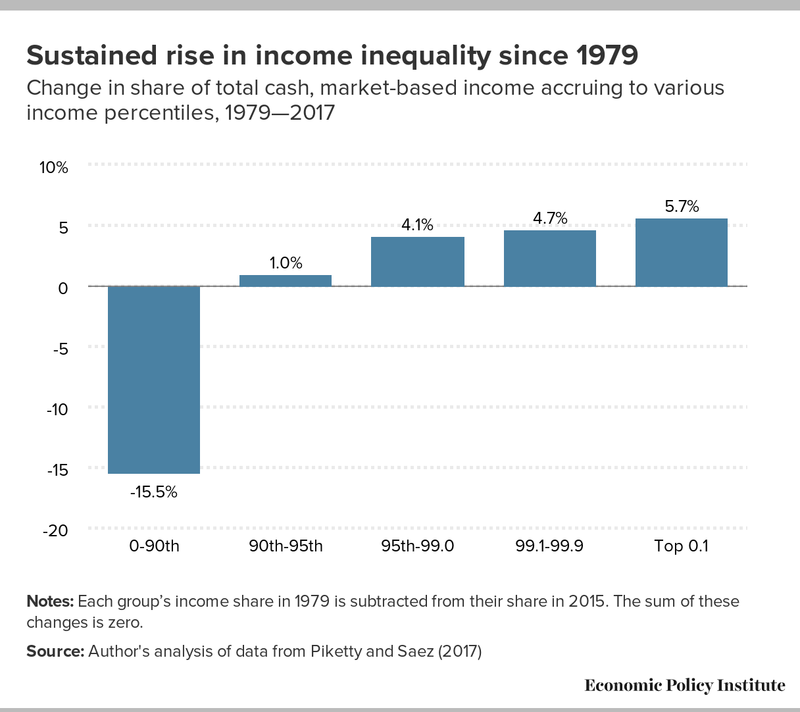 This inequality is damaging to the American economy most directly because it reduces the income accruing to low- and middle-income families. But inequality is also damaging to the economy because the redistribution of income to the top of the distribution, all else equal, reduces aggregate demand. Higher-income households spend a smaller fraction of their income (both overall and of each marginal dollar) than do low- and middle-income households.4 This means that transferring lots of income from low-saving to high-saving households will reduce national spending. Of course, the effect of this redistribution on aggregate demand can be neutralized through other means. The most obvious mechanism to neutralize it is a decline in the neutral rate of interest, as savings rise and push down the “cost” of savings to potential borrowers, and lower interest rates spur business investment. But this mechanism obviously has a limit: the ZLB. Notes: Each group’s income share in 1979 is subtracted from their share in 2015. The sum of these changes is zero. The global savings glut was first named by Fed chairman Ben Bernanke in a 2005 speech (Bernanke 2005). It referred to the large excess of savings over investment in large regions of the world (mostly East Asia as well as oil-exporting countries). Much of this excess savings was used to buy dollar-denominated assets. This in turn bid up the price of the dollar in global markets. This expensive dollar made U.S. exports expensive in global markets and made imports coming into the United States cheaper, resulting in a large rise in the U.S. trade deficit. All else being equal, this rise in the trade deficit reduces aggregate demand for U.S. production. In theory this inflow of savings into the U.S. economy could have lowered interest rates and hence boosted aggregate demand by spurring consumption and investment spending. But, again, this effect is greatly weakened in a world in which below-zero rates are needed to keep aggregate demand high enough to spur full employment. Further, the lower interest rates spurred by the inflow of foreign savings into the U.S. economy are precisely the source of the phenomenon—the falling neutral rate of interest—that makes future episodes of hitting the ZLB more likely. While the rise of inequality and the global savings glut both worked to increase the supply of available savings and hence to lower interest rates, the market for loanable funds also has a demand side.5 The demand for these funds is driven by the investment plans of businesses, firms, and households. To be clear, we are using the macroeconomists’ definition of investment—buying physical plant and equipment. This type of investment is often financed by taking on debt, so these investment plans increase the demand for loanable funds. A key spur to business investment (the largest component of national investment) is the need to equip workers with necessary capital to do their jobs efficiently. So, as the size of the nation’s workforce grows, business investment must grow in tandem just to keep workers well-equipped. A key feature of the U.S. economy in recent and coming years is a pronounced slowdown in the rate of labor force growth, due to the aging population of the United States.6 This implies, all else equal, a decline in the demand for loanable funds, which puts downward pressure on interest rates and leads to a reduction in the long-run neutral rate. Surveys have shown that non-economists tend to think that higher inflation reduces their standard of living, almost by definition. These same surveys find that the public routinely overestimate the actual rate of inflation—often by an order of two (Shiller 1997). If these impressions were true, it would be a bad idea to advocate for faster rates of inflation. But they are not true. Take the notion that living standards would fall by 2 percent if the Fed raised its inflation target from 2 to 4 percent. If nominal wages and incomes of American households were fixed, then faster inflation would indeed lead to lower living standards. 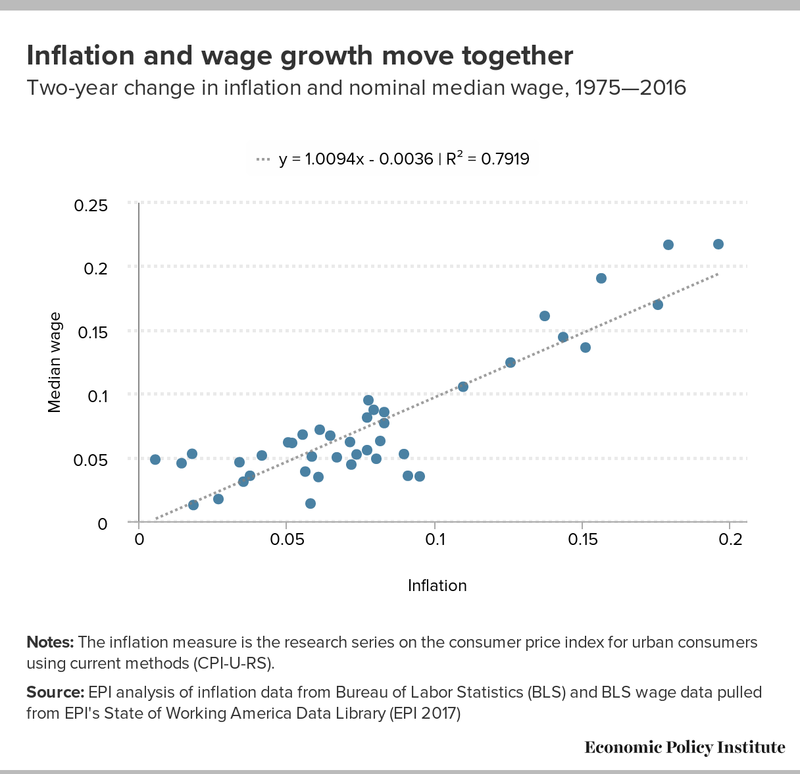 But the real-world evidence is clear that price inflation and nominal wage growth move together, as shown in Figure C. This strongly indicates that setting a higher inflation target will not harm living standards, but will instead just pull up nominal wage growth. Notes: The inflation measure is the research series on the consumer price index for urban consumers using current methods (CPI-U-RS). The link between price inflation and wage growth is easily explained. First, labor costs, on average, make up a large share of the price of a good or service, so it is actually hard to generate inflation (higher prices) without seeing the largest component of prices (labor costs or wages) rise as well. Second, the wage negotiation process clearly factors in inflation. Wages are set through (implicit or explicit) bargains struck between workers and employers. These bargains concern nominal wages, but there is an expected rate of inflation embedded in these bargaining positions. For example, if you are confident that your employer values you as an employee and you decide to ask for a raise, you will base the size of the requested in part on expected inflation; your request would of course be higher in a world with 10 percent inflation than in one with 1 percent inflation. In a world with 10 percent inflation; any nominal wage increase of less than 10 percent is a cut in real (i.e., inflation-adjusted) pay. If employers in a 10 percent inflation economy could get away with cutting real wages by 10 percent simply by holding nominal wages constant in the face of inflation, why wouldn’t they have cut wages already? Thus, if the Fed announced a higher inflation target, wage bargains between employers and workers would quickly take this higher expected rate of inflation into account. Again, many people seem to not believe this, but the evidence in the figure above is clear. Finally, it is often claimed that retired American households living off “fixed incomes” will be hurt by inflation increases. But by far the single most important source of income for the vast majority of retirees is Social Security, and these payments are fully indexed to inflation, so if the Fed moved up its inflation target (and hit the target), then Social Security payments would mechanically follow. At the depths of the Great Recession, some estimates indicated that the U.S. economy needed real short-term interest rates that were negative 8 percent to restore full employment.8 But the lowest real interest rate that could be achieved at the ZLB during the Great Recession was negative 2 percent, far too high to restore full employment. Negative 2 percent was as low as we could go because the U.S. economy went into the Great Recession with inflation closer to 2 percent. The U.S. economy went into the Great Recession at 2 percent inflation because the Federal Reserve had worked hard over preceding decades to pin the expectation of inflation held by households and businesses and financial markets at this 2 percent. These facts alone strongly argue that entering a future ZLB economic situation with higher inflation would be preferable, simply because it would give the Federal Reserve’s conventional policy response (lowering short-term interest rates) much more traction in spurring recovery. However, the case against entering another ZLB episode with today’s low inflation target is even more compelling because of the economic dynamics that take hold when we hit the ZLB at low inflation. To understand this trap, think of a car trying to navigate up a steep hill during icy conditions. While normally we might think that slower speeds are safer, if the car hits the hill going too slowly, it will lose momentum before cresting and may begin sliding backward down the hill. But if the hill is reached at a higher speed, momentum can help the car safely navigate over the crest. Of course, there is a trade-off; hitting an icy hill at a recklessly high speed is unwise, but so is trying to creep too slowly up it. Figure D illustrates the importance of entering recessions with space for lowering real short-term rates. 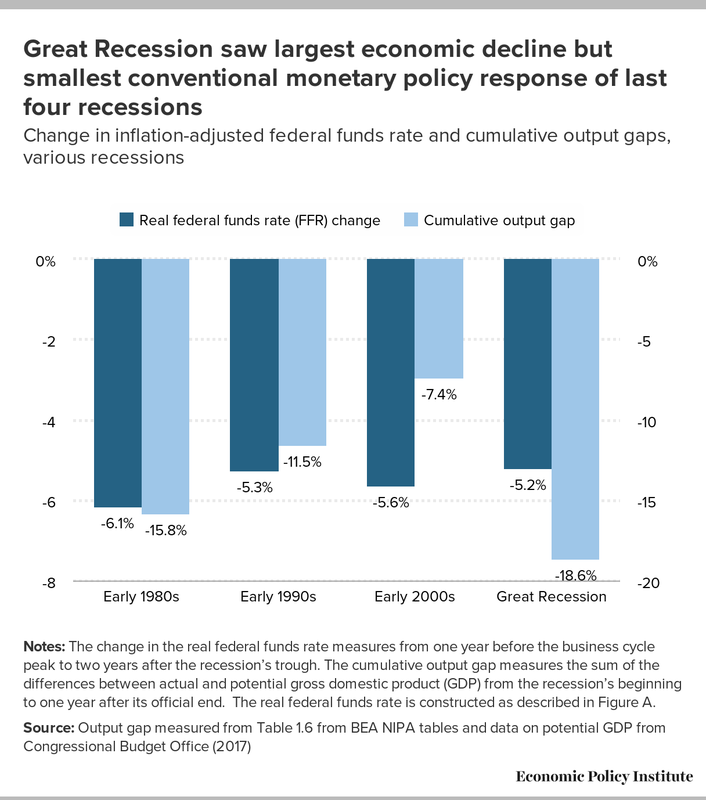 It shows the peak-to-trough reduction in the federal funds rate over the past four recessions as well as the cumulative output gap over the recession. (The output gap measures the difference between the actual output of the economy and the goods and services it could have produced if running at full capacity and thus is a measure of how severe the recession was. The Great Recession saw the largest cumulative output gap yet the smallest peak-to-trough reduction in the real federal funds rate. Notes: The change in the real federal funds rate measures from one year before the business cycle peak to two years after the recession’s trough. The cumulative output gap measures the sum of the differences between actual and potential gross domestic product (GDP) from the recession’s beginning to one year after its official end. The real federal funds rate is constructed as described in Figure A. By definition, debt is a transfer from entities that are saving and hence have resources for lending to entities that are borrowing because their spending needs are greater than their current income. This means, by definition, that debt growth directly supports aggregate demand growth. But just as taking on debt is a transfer of resources, events that subsequently change the value of debt necessarily transfer resources as well. Unexpected inflation is a direct transfer from lenders to borrowers. Imagine a bank that loans somebody $10,000 on January 1, 2018, in return for receiving $11,000 on January 1, 2019. Imagine further that both the borrower and lender expect 5 percent inflation over this period. This implies a real interest rate of 5 percent (the 10 percent nominal rate implied by paying back $11,000 on a $10,000 one-year loan, minus the 5 percent rate of inflation over the period). Now, say that inflation is instead 10 percent over the year. This makes the real interest rate paid by the borrower and received by the lender equal to zero. It is exactly this transfer driven by unexpected inflation that explains much of the politics of low inflation targets. Lenders strongly prefer to keep a tight lid on inflation and ensure that the macroeconomy never “overheats”; that is, never sees unemployment low enough to spark faster wage growth that leads to higher price inflation. Lenders are, by definition, wealthy. This is why they have accumulated resources to lend out. Wealthy households, in turn, tend to have their preferences given disproportionate weight in policy debates, and this can certainly explain (at least in part) why the Fed has adopted a very low inflation target—2 percent annual inflation. Unexpected disinflation—inflation coming in lower than market participants expected—is a clear transfer from borrowers to lenders. This fact is what makes the combination of a falling long-run neutral rate of interest, a low inflation target, and high household debt so dangerous. In the previous section, we sketched out a scenario in which the economy was hit by a negative shock to aggregate demand and entered a recession with short-term interest rates at zero. If it hit this ZLB with a low inflation target, it could see the “low inflation trap” whereby stagnation leads to slow wage growth, which pulls down price inflation, which increases real interest rates, which deepens stagnation. On top of all of this, however, is the fact that slowing inflation also transfers purchasing power from borrowers to lenders. This transfer will in turn further slow the economy. Borrowers, by definition, are spending all that they receive in income (and more—that’s why they’re borrowers). Lenders, by definition, are spending less than they receive in income (that’s why they have resources from which to borrow). So this transfer from borrowers to lenders will be accompanied by a slowdown in spending growth, which will drag even further on aggregate demand. 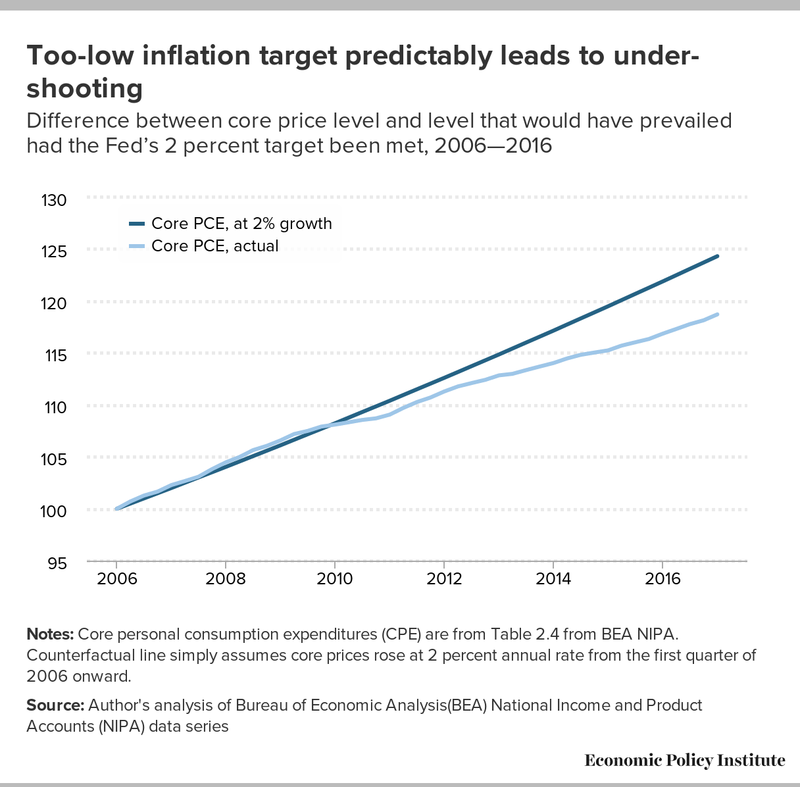 Figure E shows the difference between actual growth in prices since 2006 compared with how these prices would have grown had the Federal Reserve maintained a 2 percent inflation target consistently over the past decade. As the figure shows, the Fed has been unable to meet even its own too-low target. The shortfall of actual prices relative to where they would be had the 2 percent inflation target been maintained represents a steady transfer of purchasing power from borrowers to lenders, and even further downward pressure on aggregate demand growth. Notes: Core personal consumption expenditures (CPE) are from Table 2.4 from BEA NIPA. Counterfactual line simply assumes core prices rose at 2 percent annual rate from the first quarter of 2006 onward. To make this concrete, imagine a home buyer took out a 30-year mortgage with a $2,000 monthly payment in 2006 expecting inflation to run at 2 percent over the course of the loan. She would have forecast that her nominal payment would be significantly eroded by inflation by 2017. But, because actual inflation has come in consistently below the Fed’s 2 percent target, by 2017 she would be paying $110 more each month than she had forecast (or $1,335 more per year) in inflation-adjusted terms. Across all home buyers, this financial hit could crowd out demand for currently produced goods and services and slow aggregate demand growth. Another lesson of this graph is that entering a ZLB episode with too low an inflation target actually makes it hard to maintain the target. It might seem odd that it’s harder to prevent undershooting a low target than a higher one, but the economics argue strongly that this is likely true. The Fed failed to maintain the 2 percent core inflation target because it (and other policymakers) failed to quickly rectify the shortfall of aggregate demand following the negative shock of the Great Recession. This failure to maintain aggregate demand occurred because the Fed was unable to lower the real federal funds rate low enough to restore full employment. Somewhat perversely, in a world where chronic demand shortfalls may emerge, having too low an inflation target severely strains the credibility of the claim that the Fed can successfully navigate the economy at this target and not chronically undershoot it. The strongest case for a higher inflation target hinges on its usefulness in making conventional monetary policy more effective in fighting recessions and spurring recoveries at the ZLB. But couldn’t policymakers keep the same inflation target yet rely more heavily on other macroeconomic stabilization tools—such as unconventional monetary policy (credit-easing programs and large-scale asset purchases) and fiscal policy—to fight recessions? In theory, they certainly could, and fiscal policy is particularly effective in closing aggregate demand shortfalls. But a key lesson of political economy in the past decade has been that our political system can fail terribly at delivering timely and effective discretionary policies aimed at fighting recessions. While fiscal stimulus packages were passed in 2008, 2009, and, to some degree, 2010, fiscal policy since the Budget Control Act of 2011 has been historically contractionary on the spending side.10 This spending austerity can entirely explain why recovery from the Great Recession has been the slowest on record.11 The pronounced weakness in spending over the current recovery is striking given the information from Figure C indicating that the Great Recession was the worst on record and yet conventional monetary policy had less room to operate on this recession compared with previous ones. These facts argue strongly for crafting “automatic stabilizers” to blunt negative aggregate demand shocks in the future. On the fiscal front, automatic stabilizers are programs that direct more income to struggling households when the economy is in distress without requiring Congress to pass new legislation. Progressive taxes and means-tested safety net programs (such as unemployment insurance, Medicaid, and food stamps) are the most important automatic stabilizers, providing a boost to purchasing power through fiscal policy as private incomes fall. On the monetary policy side, the Fed should adopt a higher inflation target as a potential automatic stabilizer. Unlike rate cuts, credit-easing programs, and large-scale asset purchases, each of which require Fed action at the time of need, setting a higher inflation target in advance could help the economy avoid “low-inflation traps” that will interact particularly badly with high levels of debt, thereby effectively and, crucially, automatically providing a backstop against negative aggregate demand shocks. The Federal Reserve, and indeed central banks around the world, have adopted inflation targets that are too low given the realities of modern economies. These realities include rising inequality, growing regional savings gluts, and aging populations—all of which will predictably slow aggregate demand growth, and put downward pressure on the long-term neutral rate of interest. This in turn means that recessions pushing economies to the zero lower bound on interest rates will be increasingly common, and that the primary conventional tool for fighting recessions—lowering short-term interest rates—will become less effective. These new realities and the dreadful (and ongoing) damage done by the Great Recession should spark a reassessment of all ruling tenets of macroeconomic policymaking. One of the core tenets that should be rigorously reassessed is the too-low inflation target of the Federal Reserve. This 2 percent target hardly has an impressive intellectual grounding. It was essentially picked because it would appease competing factions. Those who wanted zero percent inflation could tell themselves that inflation was overstated in our data-collection agencies, so 2 percent reported inflation was as good as zero actual inflation.15 For those who thought zero percent inflation was too low and would lead the economy to excess unemployment, a 2 percent target seemingly assuaged their fears.16 It was also chosen in the 1990s, when the problem of chronic demand shortfalls leading to more-frequent ZLB episodes was largely discounted. If 2 percent was the proper target when adopted, it seems quite hard to see how it remains appropriate given the change in economic conditions. 2. Very recently, some European central banks have managed to set slightly negative short-term rates. It remains doubtful whether these negative rates will be sustainable or ever dip low enough to spur full employment. 3. Another oft-mentioned influence driving down the neutral rate is the falling price of capital goods relative to consumption goods. As capital goods needed for investment become cheaper (think of the falling price of computers), less and less money is needed to meet a given real investment target. This can reduce the demand for loanable funds needed to finance investment, thereby lowering interest rates. This declining relative price of capital goods, however, is relatively recent and it is far from clear that this may not reverse in the future. Hence, we leave it out of our discussion in this paper. 4. See Cynamon and Fazzari (2015) for estimates of how the rise in inequality has dragged on aggregate demand growth in recent decades. 5. To be clear, a loanable funds theory of interest rate determination based on flows of savings and investment is woefully incomplete. A much better (if more complex) overview of the issue is the Tobin (1969) portfolio balance approach. But the loanable funds approach does capture some rough intuition that can be useful. 6. See Congressional Budget Office (2017) and related data on this issue; CBO highlights that the working-age population grew by 1.6 percent annually from 1950 to 2001, but is expected to grow only 0.5 percent annually from 2017 to 2027. 8. See Krugman (2010) for this negative 8 percent figure. 9. As a share of U.S. gross domestic product, household debt rose from 47 percent in 1979 to 96 percent in 2007, according to the Federal Reserve (2017). 10. At the end of 2010, some of the 2001 and 2003 tax cuts signed into law by George W. Bush were set to expire. To avoid this fiscal drag, the Obama administration and Democrats in Congress agreed to postpone the expiration of these tax cuts in exchange for maintaining expansions and unemployment insurance and for a temporary payroll tax holiday. This package represented a nontrivial fiscal stimulus relative to what current law in 2010 would have provided. 11. See Bivens (2016) for evidence on fiscal austerity. 12. See Meltzer (2009; 2014) for examples of predicting inflation. 13. See Angrist, Jordà, and Kuersteiner (2013) for the empirical backing for claims that monetary policy is asymmetric; working efficiently to slow demand growth, but not working well to spur growth. 14. Congress did not pass sufficient fiscal stimulus measures to quickly restore full employment, and in fact put federal spending on a historically slow growth path precisely when the economy needed a boost to aggregate demand. The Fed acted more wisely, lowering short-term interest rates and keeping them down, but because the economy entered the recession at a low rate of inflation, Fed rate cuts could only go so far, particularly in the face of the fiscal drag. 15. See Wynne (2008) for an overview of this argument. 16. See Akerlof, Dickens, and Perry (1996, 2000) and DeLong and Summers (1988) for this view. Akerlof, George, William Dickens, and George Perry. 1996. “The Macroeconomics of Low Inflation.” Brookings Papers on Economic Activity, vol. 1. Akerlof, George, William Dickens, and George Perry. 2000. “Near-Rational Wage and Price Setting and the Long-Run Phillips Curve.” Brookings Papers on Economic Activity, vol. 1. Angrist, Joshua, Òscar Jordà, and Guido Kuersteiner. 2013. Semi-Parametric Estimates of Monetary Policy Effects: String Theory Revisited. Federal Reserve Bank of San Francisco, Working Paper Series. Bernanke, Ben. 2005. “The Global Saving Glut and the U.S. Current Account Deficit.” Remarks at the Sandridge Lecture, Virginia Association of Economists, Richmond, Va., March 10. Bivens, Josh. 2016. Why Is Recovery Taking So Long—And Who’s to Blame. Economic Policy Institute report. Bureau of Labor Statistics. Various years. Consumer Price Index. Congressional Budget Office. 2017. The Budget and Economic Outlook, 2017 to 2027. Cynamon, Barry, and Steven Fazzari. 2015. Rising Inequality, Demand, and Growth in the U.S. Economy. Institute for New Economic Thinking Working Paper. DeLong, J. Bradford, and Lawrence Summers. 1988. “How Does Macroeconomic Policy Affect Output?” Brookings Papers on Economic Activity, vol. 2. Federal Reserve Board of Governors. 2017. Financial Accounts of the United States: Flow of Funds, Balance Sheets, and Integrated Macroeconomic Accounts, Fourth Quarter 2016. Hess, Chung, Jean-Philippe Laforte, David Reifschneider, and John Williams. 2011. Have We Underestimated the Likelihood and Severity of Zero Lower Bound Events? Working Paper 2011-01. San Francisco Federal Reserve Bank. Krugman, Paul. 2010. “The Taylor Rule and The ‘Bond Bubble,’” The Conscience of a Liberal (New York Times opinion pages), August 22. Krugman, Paul. 2011. “The Low-Inflation Trap,” The Conscience of a Liberal (New York Times opinion pages), September 23, 2011. Meltzer, Allan. 2009. “Inflation Nation,” New York Times op-ed, May 3. Meltzer, Allan. 2014. “How the Fed Fuels the Coming Inflation,” Wall Street Journal op-ed, May 6. Piketty, Thomas, and Emmanuel Saez. 2017. “Income Inequality in the United States, 1913–1998,” Quarterly Journal of Economics 118, no. 1, 1–39, tables and figures updated to 2017 in Excel format. Rachel, Lukasz, and Thomas D. Smith. 2015. Secular Drives of the Global Real Interest Rate. Bank of England Staff Working Paper No. 571. Shiller, Robert J. 1997. “Why Do People Dislike Inflation?” in Reducing Inflation: Motivation and Strategy, Christina D. Romer and David H. Romer, eds. University of Chicago Press. Tobin, James. 1969. “A General Equilibrium Approach to Monetary Theory.” Journal of Money, Credit and Banking, vol. 1, no. 1. Wynne, Mark. 2008. “Core Inflation: A Review of Some Conceptual Issues.” Federal Reserve Bank of St.Louis Review, May/June.